I’m about to begin a unit on persuasive writing, with which I’ve decided I have a love-hate relationship. On one side, I absolutely love the idea of students finding a topic about which they are passionate, finding factual evidence to support their claim, and then constructing a detailed argument on that claim. However, teaching students how to write an objective paper (expository) is difficult enough. They sometimes have lapses in their logic and misinterpret facts or include background knowledge that really is a misconception rather than simply a preconception. My worry with this unit is that the same will happen–except the consequences will be worse. I’ve really been struggling with this the past couple days. I’ve tried to do some of my own research, construct some argumentative mentor texts in which I argue the pros and cons of different energy forms, but it still just doesn’t feel “right.” I know, if I continue down this path, then they will be confused. I’m not sure how I know–I just know. I’ve always thought teacher’s intuition was a close second to mother’s. I’ve also been thinking about how relevant and important persuasive writing is. People feel compelled to persuade because they feel a moral obligation to do so. They believe that something is “right,” and because they believe that idea to be “right,” they try to prove their opinion with background knowledge and facts. However, regardless of how many facts they use, there still is an element of interpretation and subjectivity. And the places from which our morality come might be drastically different–leading to drastically different morals. I continued to think about this this morning while in the shower, where I do a lot of my good thinking, and it dawned on me that I have been approaching this from the wrong standpoint. My enduring understanding, is not People use persuasive or argumentative writing to express an opinion. My enduring understanding for this unit needs to be People use their background knowledge, experiences, and facts to determine right from wrong. I’m going to provide the kids with a group ideas that they will need to sort into “right” and “wrong.” Some of these ideas are rather controversial for ten-year olds like “Justin Bieber is annoying” or “Only girls should wear pink,” which is intended to get them arguing to defend their opinions. At the onset of this activity, I’m not going to mention the word opinion, though. It is my hope that they will come to that idea on their own. There is no “right” or “wrong.” These are all opinions. In fact, they could all be argued as “right” or “wrong” depending on your experiences or your morals. Then we’ll discuss where these opinions have come from. I’m hoping that they will begin to reference personal experiences, texts they’ve read, or movies they’ve seen. Through this discussion, I would like them to construct the idea that persuasive pieces will contain facts and background knowledge, all in an effort to prove an opinion or support an argument. I’ve always had trouble making this target relevant. It always seemed like a one- or two-day activity that ended with a quick assessment that most did well on. However, embedded within this unit, it is going to be come so much richer and more relevant. They will sort, once again, a series of cards that are either facts or opinions. There will be some of the cards from the previous lesson, but there will also be some cards that are objective facts. 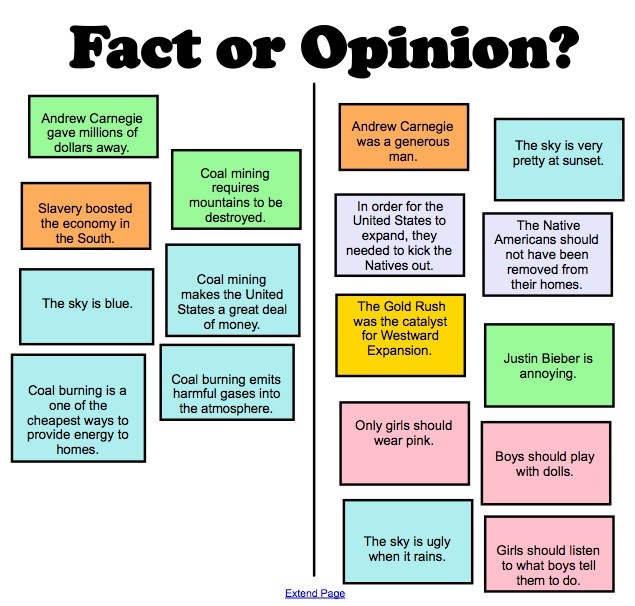 After they’ve managed to identify the facts and the opinions, I’d like to give them a mentor text, a persuasive essay. Within this text, we will, together, identify opinions and facts. From here, it is my intent that they recognize facts can be used to support opinions. Debatable Claim or Objective Thesis? e, but those, in my opinion, are not as prominent as the difference in theses. So, at this point, I’d like to give them another sort, in which they will see a series of thesis statements. They will need to sort these into debatable claims and objective theses. This will, then, help pave the way for actually creating a thesis for their persuasive essays. I’m very nervous about the topics they will choose. I would like to leave it open ended, but I’m afraid I will actually receive a paper on how annoying Justin Bieber is or why boys should be able to wear pink. There is a rather intuitive piece to this project, which I don’t think ten-year olds quite have yet. So how do I help them to see relevance in their topic without telling them that it is relevant? Perhaps to them it is relevant, and perhaps I should just let it slide. Or perhaps I should let them write it, and then when they realize that no one really cares about the topic, the relevance lesson will teach itself. I don’t know what the solution is here, but I do believe that I need to take a “process over product” stance when teaching this. A great deal of learning will come from the mere process of trying to construct an argumentative paper. Looking forward to some excellent learning this week! Please follow, retweet, or like, if you are enjoying reading!